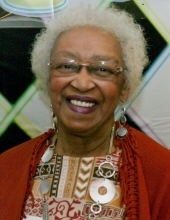 Frances Clintelle Howard was born July 16, 1933 to George and Edna Howard in Denver, CO. The eldest of five children, George, Gerald, Lafair, and Cynthia. She is preceded by her beloved husband Charles, her parents George and Edna and brothers George, Gerald and youngest sister Cynthia. Frances had been an avid reader since she was introduced to the library at Whitier Elementary school Until the time of her going home on April 4, 2019, she would consistently read no less than ten books a week. She graduated from Manual High School. Prior to her graduation she met Charles S. Thomas, the love of her life. They were married on March 9, 1952. From this union four children were born to them; Linda, Susan, Charles, and Alyce. She has five grandchildren and nine great-grandchildren and two great-great-grandchildren. Frances worked as a ward clerk in the ICU at University Hospital in Denver for 20 years before retiring. In retirement she volunteered at the Del Mar Circle Senior Center and participated in the Silver Sneakers program for seniors in addition to sitting on the council at the center for several years. We will miss the strength, grace, kindness and abundant love she so generously poured out on us and everyone she met. She was mom, confidant and friend. We have been so enormously blessed to have had her in our lives. To send flowers or a remembrance gift to the family of Frances C. Thomas, please visit our Tribute Store. "Email Address" would like to share the life celebration of Frances C. Thomas. Click on the "link" to go to share a favorite memory or leave a condolence message for the family.